The iridescent effect of some pieces is due to a significant amount of needles placed perpendiculary to the slice. All of our tourmalines slices are polished on both sides. 15 x 15.8 mm. Thickness: 1.1 mm. 17.4 x 16.7 mm. Thickness: 2 mm. 19.2 x 17.3 mm. Thickness: 3.3 mm. 15.714.4 x mm. Thickness : 2.3 mm. 32.1 x 30.7 mm. Thickness: 4.3 mm. 22.5 x 19.3 mm. Thickness: 1.6 mm. 38.1 x 33.2 mm. Thickness: 2.9 mm. 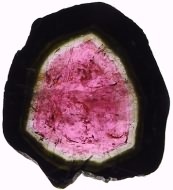 »» Pair slice ¦ Set slice ¦ Tourmaline data Growth zoning in a tourmaline crystal.